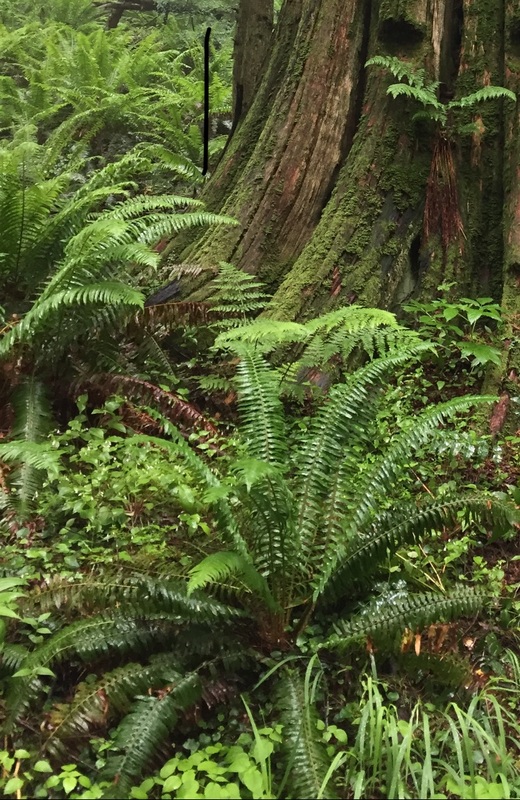 Are extreme temperatures contributing to the Seward Park sword fern die-off? 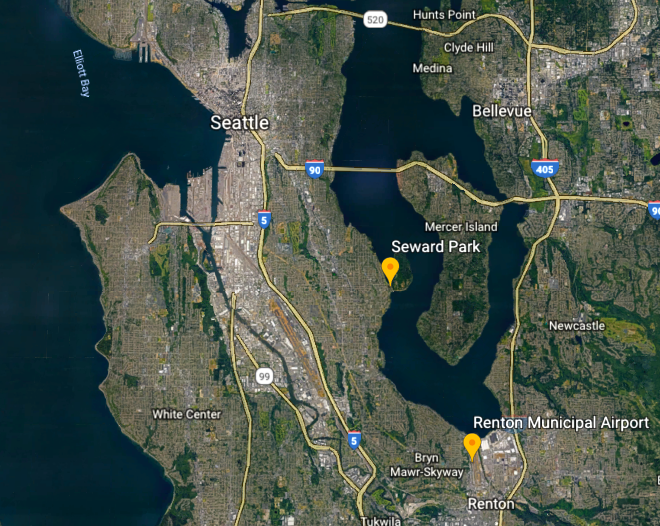 What I found particularly alarming about this die-off is that one of the most damaged areas is within Seward Park, one of the few remaining stands of old growth forest in Seattle. Why would the sword ferns be dying in what seems like an ideal native habitat? Paul Shannon, the Seward Park forest steward, has maintained a blog detailing the quest to find the source of the die-off. He has partnered with local scientists and experts to investigate several causes, including soil toxicity, pathogens, and invasive species. Recently Paul contacted me about the die-off and I offered to investigate any changes to the local climate around 2010, the time that the die-off was first observed. 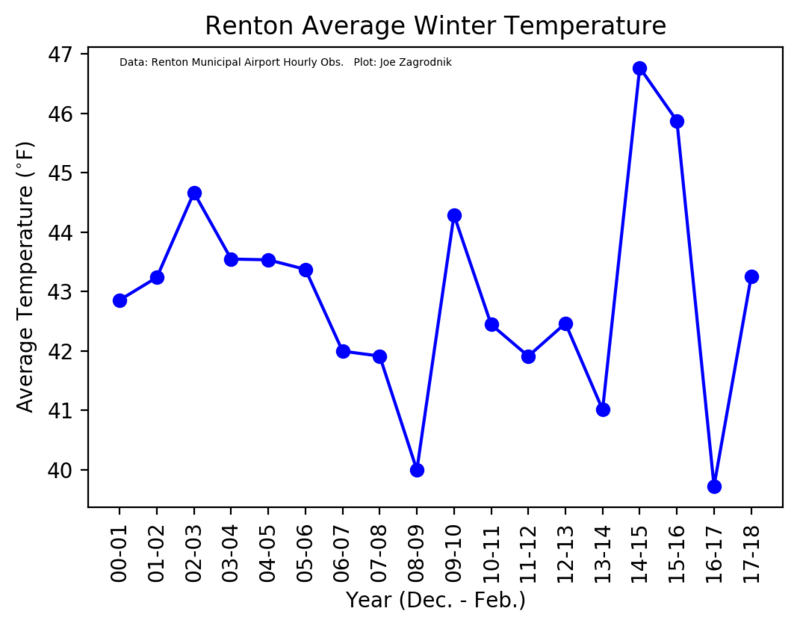 For this project I decided to use hourly temperature data from Renton, WA (KRNT) because it is located closer to Seward Park than Sea-Tac airport and is along Lake Washington at about the same elevation as the park. Reliable data is available from 2000-present. No sign of anything unusual in the temperature data around 2010. There were two sets of relatively warm years–one in the mid-2000s and another from 2013-present. The warm years are especially pronounced in the summer although the winters of 2014-15 and 2015-16 were both quite warm. Most of the year-to-year changes can be attributed to natural variability and the recent record warm summers occurred after the die-off started. Another hypothesis is that the sword ferns could be more sensitive to temperature extremes. Perhaps they are stressed by extreme warm temperatures in the summer? In general there were less warm temperatures in the years surrounding the 2010. The one exception is 2009 which had a remarkably warm period in late July. 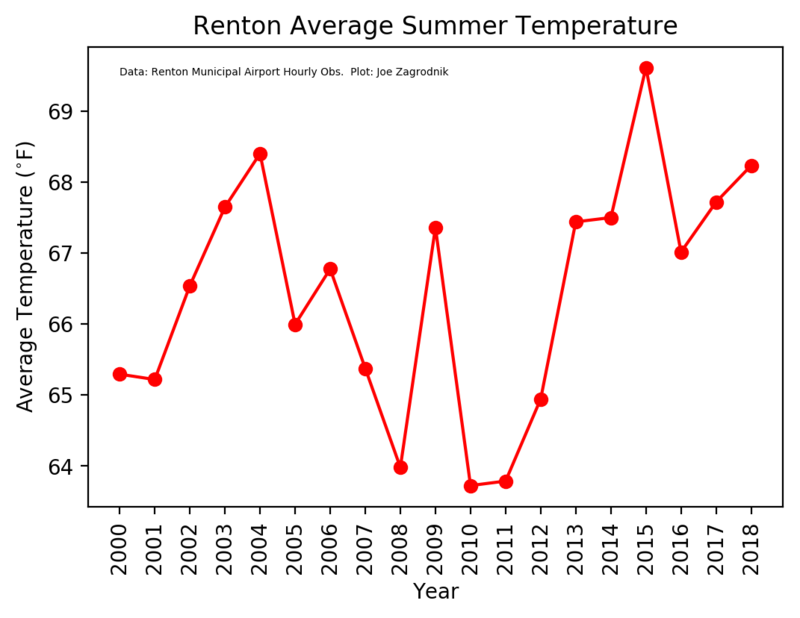 Renton reached 105 degrees on July 29, 2009. Was one extreme heat wave enough to cause damage to the sword ferns? It seems unlikely. What about extreme cold? If cold winter temperatures are responsible for killing a pathogen, perhaps a lack of extreme cold would increase the prevalence of a disease? 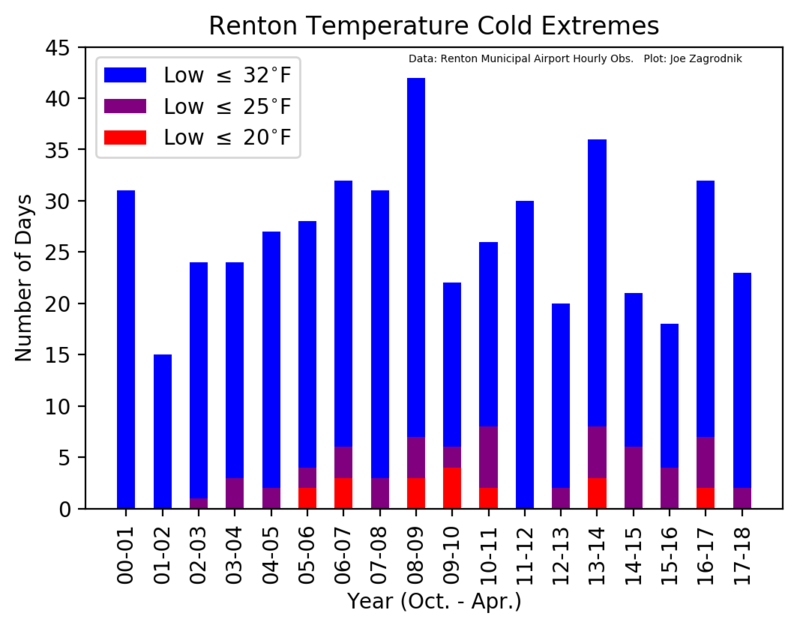 No trend is apparent on the extreme cold plot. The years around 2010 had several days with lows in the upper-teens to low-20s. Cold temperatures were much more common in the mid-20th century, especially the 1950s. From these plots, it appears there was no appreciable change in temperature extremes around the year 2010. 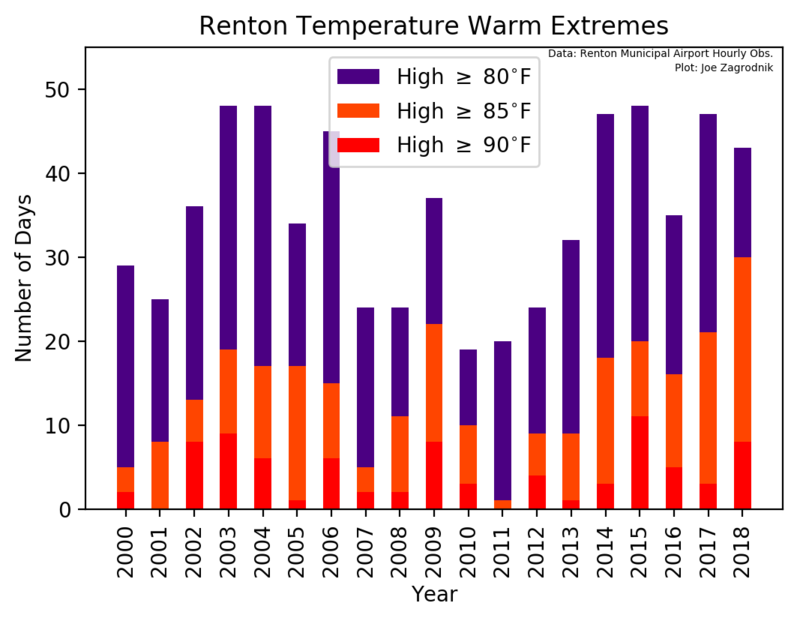 This is consistent with other regional climate records showing that the climate of Puget Sound has only changed slightly in recent decades. While these results do not rule out any climate/weather related causes, they do suggest that extreme temperatures are unlikely a major contributor to the die-off. There also remains a possibility that sword ferns could be stressed by future changes to the climate that are expected in coming decades. In the meantime, I’m hopeful that an explanation can be found for the sword fern mystery. Is Seatac’s 90 degree streak real?